Can I tell you a secret? I have not always been a fan of Halloween. I’m not really sure why, but I’ve come around and now feel comfortable teaching a Halloween song or two. As I prepare lessons for my K-6 classroom I try to incorporate songs and activities that feel like Halloween without being too scary or creepy. We do many songs about pumpkins and spiders and so on. At one district we avoided everything Halloween and even called the classroom celebrations on that day “Fall Parties”. At another school we celebrate with a big parade, all students and most staff members dress up and hang decorations in our classrooms and on bulletin boards. You probably know which end of the spectrum your district falls into and can adjust some of the activities below to suit your needs. Below you’ll find a small compilation of ideas for October and some fun ideas for Halloween in the music room. 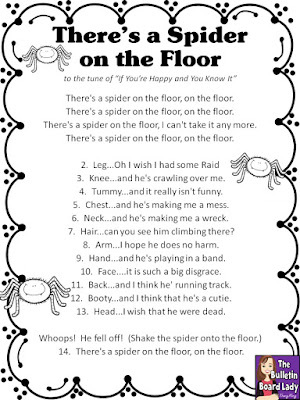 This fun song is great for Kindergarten and First Grade. It is sung to the tune of “If You’re Happy and You Know It”. I start by modeling this song, but honestly by the time I get to verse three they can’t resist singing along, pausing to hear the new part of the verse. Because this song isn’t specifically a Halloween song, I often tie it into the change in the weather and how spiders and flies want to come in to our warm houses instead of staying out in the cold. This gives us an opportunity to sing the song another day. The second time we’ll make up new (and often sillier) verses. 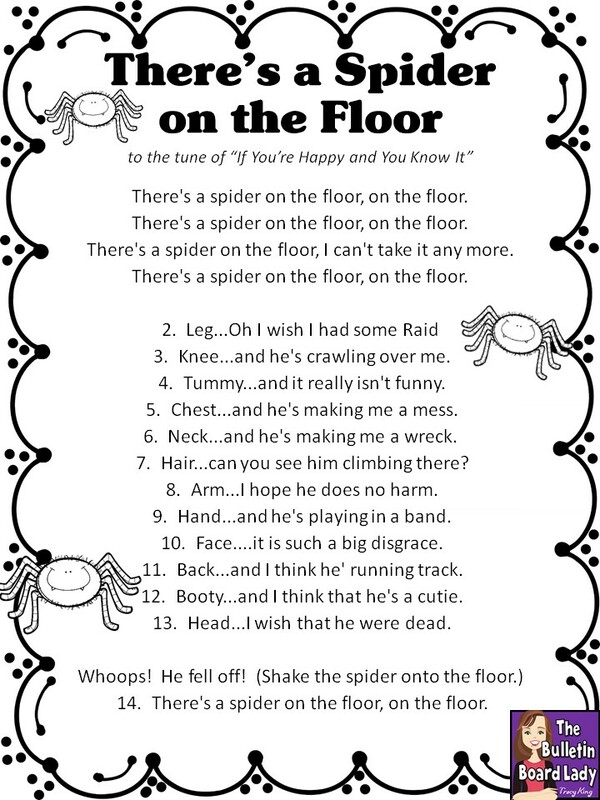 This is a fun song to sing with 1st and 2nd Graders. We learn the song by rote adding actions with each phrase. Next, we sing and move with a partner. Pumpkin patch, Pumpkin patch. Looking for a pumpkin in a pumpkin patch. Here is one, nice and fat. Turn into a Jack-o-lantern, just like that. Sol sol mi, sol sol mi, do do do re mi mi sol fa mi re do. Sol sol mi, sol sol mi, do do do re mi mi so fa mi re do. “pumpkin patch” =clap hands twice on “pumpkin” and in the air on “patch”. Later transfer the air clap to a partner’s hands. Do this for every “pumpkin patch” in the song. “turn into a Jack-o-lantern” =turn around with arms still outstretched. Later join hands with a partner and turn in a circle. I have a Symbaloo page with some of the songs we might add at the beginning or end of class if we have time. They are short and simple and are probably most useful for 2nd grade or younger. 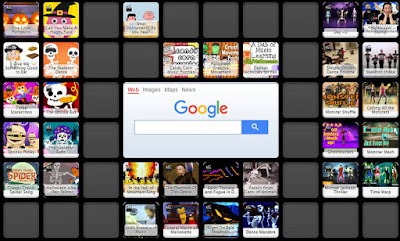 The link to this Symbaloo page is at the bottom of this blog post. Such fun! I don’t always do this each fall, but it always seems to work its way in for at least one grade level do to an oddity in scheduling or special events. Often I’ll do this activity during the week of parent teacher conferences with the one class that I will see from a specific grade level. 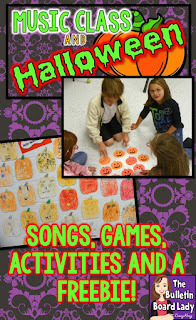 Students use the chart that I give them with music symbols to create an interesting jack-o-lantern face. They can use them in any fashion, upside down and in any color. I walk around while they are working on them and quiz them on the names of the symbols or explain what they are if they are new to them. I have a bulletin board kit for this project too. It looks great mixed in with the student projects. The chart that I give them is in this kit too. I do centers at least once every four times I see students so seasonal workstations are so much fun! With the Candy Corn Puzzlers I actually had the whole class do the same puzzles in small groups. Fourth graders worked pitch names, 5th grade worked on recorders, etc… I allowed about 10-15 minutes for this activity including the time it took us to break into groups and get supplies. If you have the puzzles in a little baggie you could probably do this in less time. This is a quick and easy game to create and to play. It is essentially a matching game. The pumpkins have four-beat rhythms on the back side of the jack-o-lantern. I created a duplicate of each pattern so that students could match them up. I created this set specifically for what fourth graders would know this time of the year. You could create multiple sets that were usable with more than one grade level. Students turn the pumpkins so that the rhythms are face down and take turns turning over pairs of pumpkins. If they find a match, they keep it. The person with the most matches wins the game. Often they will have time to play multiple times before our time is up. Oh my goodness! This set of creative movement cards is so much fun! I turn on some awesome seasonal songs and then hold up the posters for students to imitate. It is so fun to see students do the “The Broom Dance” or the “Zombie Wobble”. The idea is that students get to interpret the move named on the poster in any reasonable way. Wow! What creativity! In this set there is also a freeze dance setof posters too. If you like them, I have several more themes that you can use. They are also fun to mix and match. I buy a bag of mini pumpkins at Walmart each year for Pass the Pumpkin. I divide students into small groups of 4-6 and we say the pattern “Bounce, 2, 3, Pass”. This allows students to pass every four beats. This is fun for Kindergarten and 1st. With older students we make the pattern shorter with “bounce, pass” or “pass, pass, pass, pass” on each beat. The word “bounce” doesn’t actually mean bounce it on the floor! Messy! It means to bounce it in the air to show the beat. Here’s a video of a 1st grade group from a long time ago. This was their first attempt at “bounce, pass, bounce, pass”. *giggle* Not perfect, but certainly fun! I think it is so important to keep kids moving so I have several go to movement activities and videos. I’vegrouped some of the Halloween videos on a Symbaloo page. 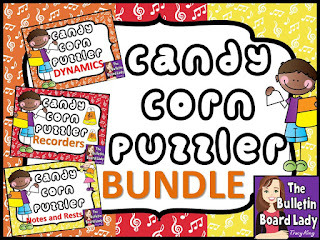 You’ll also find the links to a few sing along songs for the lower grades. Enjoy!